Morning Light Maiden Hair Grass is a good ornamental grass for the landscape in the Hudson Valley. 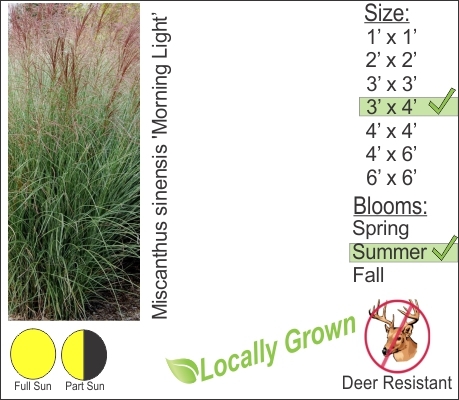 This grass is deer resistant and grows a bit larger than the other variety of grasses we carry. You can use Miscanthus (Maiden Hair) to screen your patio during the growing season. The variety Morning Light features a finer leaf blade from the parent species, also Morning Light’s leaf blades have more of a cream coloring to them.